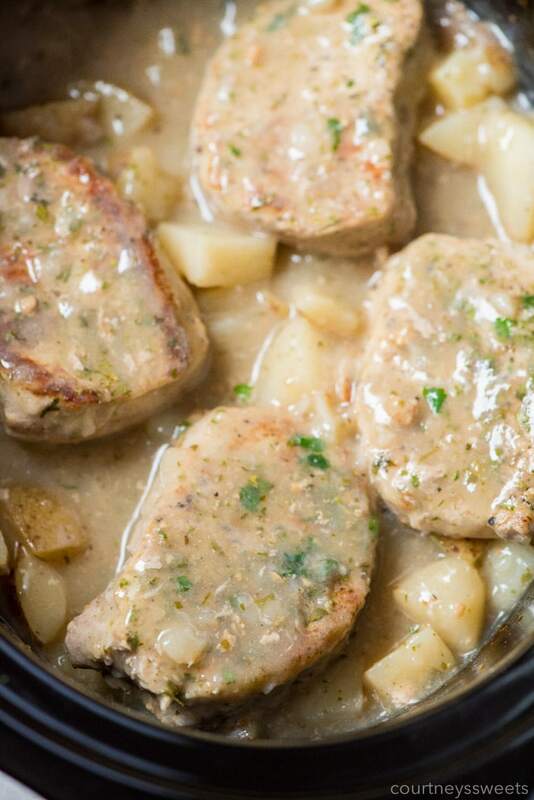 Slow Cooker Pork Chops and Potatoes always makes for a quick and easy slow cooker dinner! Set this in the morning and cook on low for 6-8 hours or set in the early afternoon and cook for 3-4 hours. 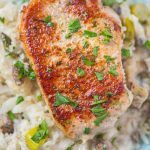 When the leaves start falling I crave comfort food and pork chops and potatoes in the slow cooker are one of our favorites! We love making this recipe as is, but we also love adding in carrots and celery. When you add those two veggies it takes on the flavors of a freshly made chicken pot pie, but with pork! Seve with some homemade biscuits for a filling and delicious home cooked meal! I love meals that are set and forget. I just let the crock pot pork chops and potatoes cook while I’m doing things and no need to babysit the cooking process. 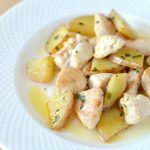 To keep this simple I use most ingredients that we all have in the house. 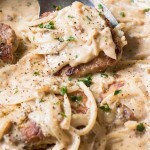 You can make this slow cooker pork chops potatoes with mushroom soup, cream of chicken soup, or even cream of celery soup. My husband isn’t a fan of mushroom so when I make for him with the cream of chicken soup. If he’ll be missing dinner due to work I’ll use mushroom sometimes. 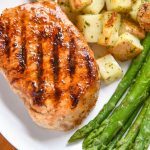 I don’t just throw the pork chops into the crockpot. I like to cook them on the skillet with a little salt and pepper on a skillet to give them a nice crust. 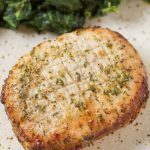 This really brings out some flavor as well and makes for a better presentation than just letting the slow cooker cook pork chops. They get a nice browned color. 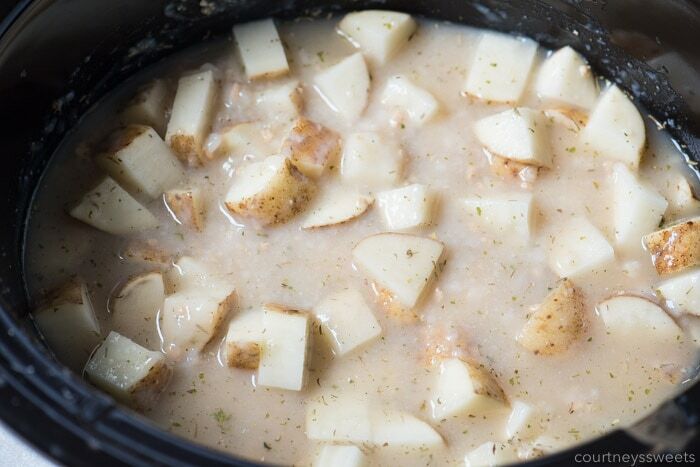 While I brown the pork chops I like to cut up the potatoes and get those into the slow cooker. Then I dump in the soup and seasonings and give it a good mix. 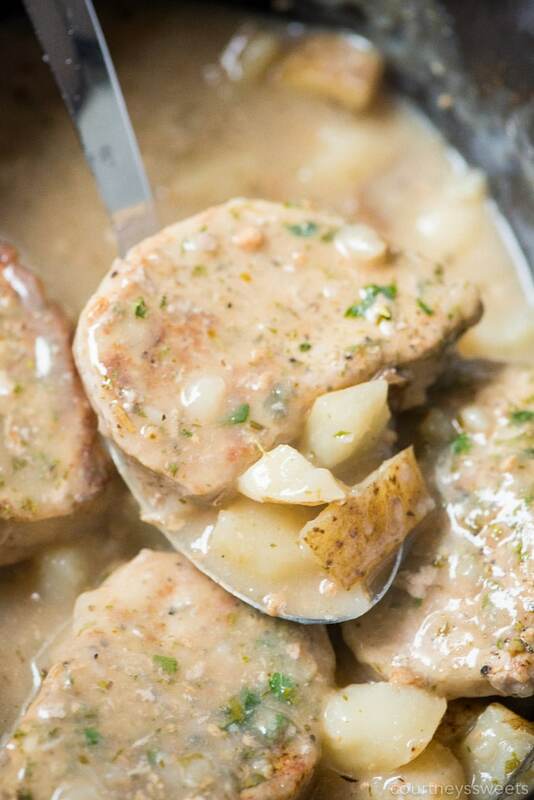 I add boneless pork chops in the crock pot once they’re nice and browned. 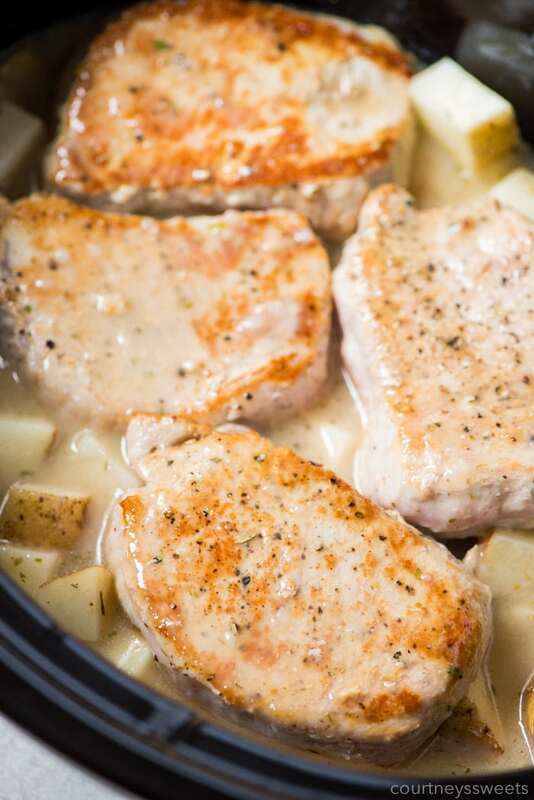 How long do you cook pork chops in the crockpot? I like to cook these for 3-4 hours on high or 6-8 hours on low. 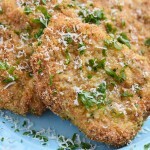 Once the slow cooker pork chops and potatoes are done I serve with a biscuit and a side salad. 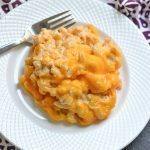 My family loves this comforting slow cooker fall meal and we hope you do too! 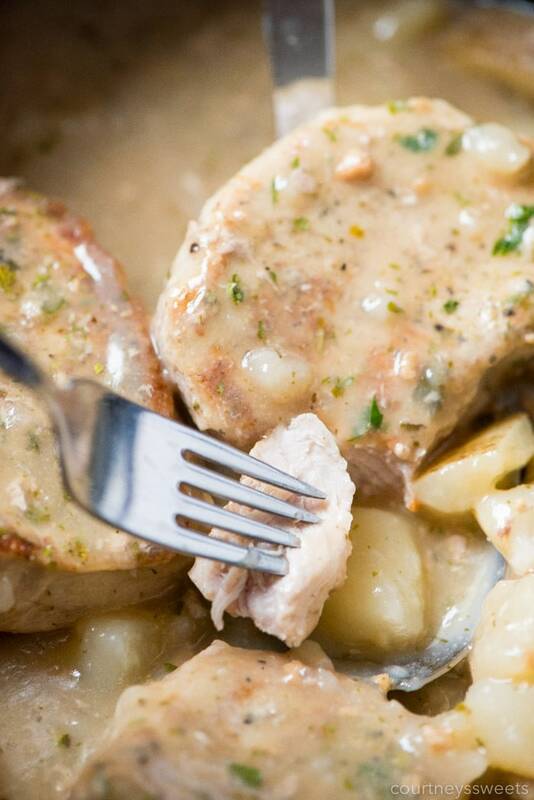 Slow Cooker Pork Chops and Potatoes always makes for a quick and easy slow cooker dinner! Heat the olive oil in a skillet on medium-high heat. 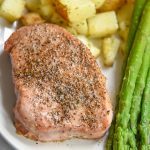 Season the pork chops with a little salt and pepper. Sear the pork chops on both sides until browned (no fully cooked) and remove from the pan. 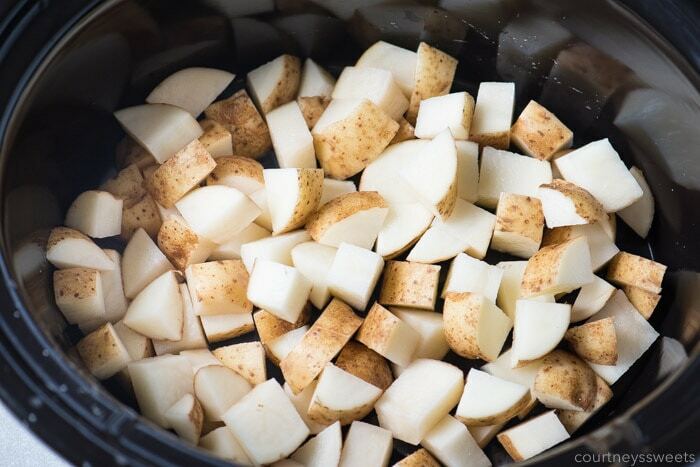 Chop up the potatoes and place into your crockpot. Pour in the soups and the seasonings over the potatoes and mix around. Add in the pork chops and then put the lid on the crockpot. 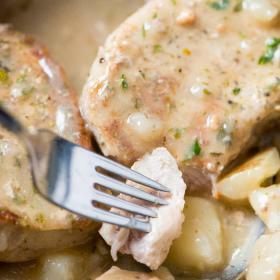 Set your crockpot slow cooker for 3-4 hours on high, or 6-8 hours on low. If you want the sauce thicker remove some of the liquid and mix in with 2 teaspoons of cornstarch 30 minutes before the cook time is complete. This will allow the sauce to thicken.